Solid iPhone first-person shooter Call of Duty: World at War: Zombies is getting its first new downloadable map tomorrow, Activision told Kotaku today. "What you are getting is a better experience than the original App," Treyarch community manager Josh Olin told Kotaku. "The first level we released is a little bit bare-boned. With each map we released on the console we released all new mechanics, we're following the same approach with the iPhone." Olin says that Verruckt also gives the co-op game more of goal than just survive. "You need to work as a team," he said. 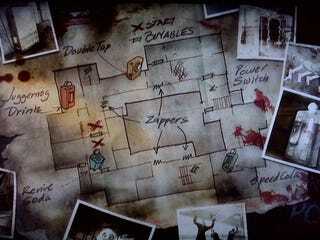 "If you play four player, you spawn on two sides of the map and work your way to the power room where you can flip on the power switch that will turn on the perk machines." During a investor conference call today, Activision Blizzard announced that the lite, free version of Zombies was downloaded more than 1 million times in the first seven days. The game will be purchasable through the App Store or the game itself.